Sorry I havent posted in awhile. Life is crazy. I tried to post with internet explorer and it wouldnt let me add pictures. So had to go to Google Chrome. I keep forgetting to do that. Anyway here is a picture of a quilt I finished in Feb. Just getting around to taking some pictures. This first one was started last summer as a mystery from Gyleen Fitzgerald. You can find the pattern in her new book, "Polygon Affair". These were fun projects. 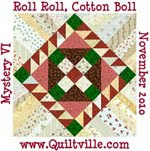 This looks like the center is appliqued, but it is all pieced. Next is Garden Path. 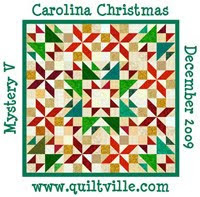 I signed up to teach at Quilters of SC retreat this fall. This will be my class if enough folks sign up. So, remember to register. you must be a member of QSC. Next is an Army quilt for a doctor at Ft Jackson that is retiring. Her friends got together and had me make this out of her uniforms and patches. I just love the way this came together. What great friends she has. And last, but not least is and updated picture of Cotton. she is 8 1/2 months old now. Trouble is her middle name. She loves to tear paper, any kind of paper. She tore up a paperback book today. At least we had read it and it was not a library book. I love her ears. We didnt crop them so they are big. she shows her expressions so much thru her ears. You just have to love her. I love the garden path quilt. Is the pattern available? I wish I could take your class, but live on the other coast. Alas, too far away! Thanks for sharing your beautiful work. 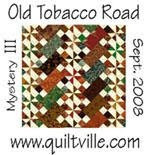 Love the quilts and glad you are posting again. Congratulations for have one photo in Gyleen's book.